Equine JointCharge makes supplementing HA easy. The secret is our patent-pending, high-molecular-weight HA concentrate you mix with tap water to transform the nearly weightless powder into a crystal clear fluid the thickness of light olive oil. In three decades of veterinary practice, Dr. Roger Nix has seen nearly as many treatments for joint issues as animals that have them. Over the counter solutions for arthritis and joint mobility can be effective, some more so than others. Therapeutic benefits of prescription-only therapies have to be weighed against their risks and cost. Inspired by a clinical study about the effects of HA supplementation in humans, and the discovery of enthusiastic anecdotes about HA’s ability to increase joint flexibility and improve performance in equine athletes, Dr. Nix began the search for a more bioavailable, affordable form of HA. The result was JointCharge.com and its patent-pending user-mixed delivery system. What Makes Equine JointCharge a Product I Can Trust With My Horses? The exclusive, patent-pending concentrate in JointCharge products is the purest, most effective form of the molecule available outside the joints. JointCharge Hyaluronan is cultured by microbial fermentation and produced in an FDA-approved lab to yield human-grade HA in the most bioavailable molecular weight. Not only is it 100% vegan, it’s free of potential protein-based contaminants and allergens. Thanks to a molecular composition that enables rapid uptake into the bloodstream, each dose delivers 300 mg of pure HA for immediate distribution to joints, ligaments and other tissues— more than three times the HA concentration of pre-mixed liquid supplements. NOTE: The benefits of HA are well known, but the products that contain it can vary in results and quality. Powdered supplements can contain trace elements that horses can sniff out and simply eat around. The HA in Equine JointCharge gets ingested, not rejected. Why Is Equine JointCharge More Effective Than Tablets, Capsules or Powders Other Companies Use? Simply put, you get more bang for your buck with JointCharge than tablets or capsules because of how quickly JointCharge’s patent-pending HA delivery system causes it to be absorbed into the bloodstream. And it's even more cost-efficient when you choose the FREE SHIPPING option (with orders of 3 or more). Why Is User-Mixed HA The Better Value? Most people are unaware that the HA in pre-mixed oral solutions actually begins to degrade in transit and continues to lose potency in storage. So what’s inside is already diluted before you break the package seal. The HA in JointCharge products is shipped dry and is inactive until you add water. So it's impossible to find a fresher, more potent, HA-based joint supplement. It’s also the purest form of HA available outside the joints themselves. Each equine dose delivers 300 mg of pure HA to joints, ligaments, and other tissues to help restore mobility, speed recovery, and improve competitive performance. Without the risk or expense of injections. How Does Equine JointCharge Work So Fast? JointCharge products are based on a patent pending delivery system that uses a molecule bioengineered to be small enough to transit the gastrointestinal barrier. This innovation allows our HA to circulate throughout the horse’s body to cushion joints and help restore suppleness to formerly stiff cartilage. Which is why, unlike non-HA or HA supplements that have degraded or don’t get fully absorbed, Equine JointCharge produces visible results faster. Compared to the cost and risk of injections, and the waste of degraded or poorly absorbed products, Equine JointCharge is a more effective -- and cost effective -- way to improve quality of life for your horse. Which Horses Benefit Most From Equine JointCharge? How Do I Give Equine JointCharge To My Horse? 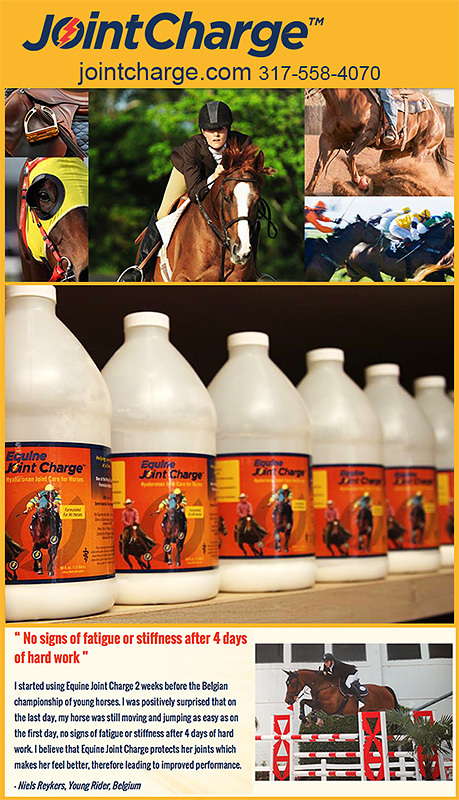 Supplementing with Equine JointCharge is as convenient as it is fast. You simply give them one pump over their feed once or twice a day (depending on dosing schedule) and that’s it. To mix, just add water and follow the simple instructions on the label or download them from the website. You can use any potable water source and no refrigeration needed -- just store it out of direct sunlight. So How Much Should I Order? Each jug contains enough concentrate to last approximately 30 to 50 days, depending on the dosing schedule you follow. Elderly horses with compromised mobility, or severely HA-depleted horses should follow the loading schedule before moving into daily maintenance. NOTE: To save money and continue the benefits of Equine JointCharge, choose the FREE SHIPPING on orders of 3 or more! Do I Need To Give Equine JointCharge To My Horse Every Day? Only you and your vet can decide what daily program is best for your horse. Up until middle age, a horse’s body produces the HA it needs every 36-48 hours. However, levels of usable HA decrease over time making it necessary to supplement it—ideally on a daily basis— in order to correct the deficit and maintain the health of joints and other tissues. Working horses such as Belgian draft horses or horses that compete on a regular basis may need supplementation at a younger age due to cushion against the stress on their ligaments and other soft joint tissues. What Do Horse Owners SAY About Equine JointCharge? My 10 year-old Dutch Warmblood mare Zaida won her fourth level musical freestyle and fourth level open classes at the Regional Dressage Championships in Lexington Kentucky last year. She was on JointCharge throughout the 2014 season and my trainer (her rider) saw significant improvement in her performance after starting on JointCharge. She was coming back from an injury to a stifle in 2013 so we hope to do even better this year. JointCharge has played a significant role in helping her to be a world-class performance horse. Thanks for your help. I started using Equine JointCharge 2 weeks before the Belgian championship of young horses. I was positively surprised that on the last day, my horse was still moving and jumping as easy as on the first day, no signs of fatigue or stiffness after 4 days of hard work. I believe that Equine JointCharge protects her joints which makes her feel better, therefore leading to improved performance. We used to inject for hock and joint issues but after a while it brings down the quality of the horse. We tried this JointCharge stuff and it worked miracles. After two weeks, all the swelling went away. I would recommend this to anyone showing like we are, or just riding for fun. 100% Satisfaction Guaranteed— 0% Risk. Order Today. Try Equine JointCharge for a month. A 30-50 day supply is just $124.50, which when compared to the cost of just one hock injection, not to mention lay ups, lack of performance, no- show time, and hold ups on training, is a very smart investment. Plus orders of three are shipped free. You’ll love the results and your horse will love the restoration of comfort and performance. And with the JointCharge 30-day, money-back HAppiness Guarantee, you’ve got nothing to lose but joint issues. Call us today!